If you have one or two big shoes retail shops, or you have channel/s to help you sell shoes, then come to buy shoes from Yiwu market. “Yiwu is a good place! ", as my client Mr.C once told me. 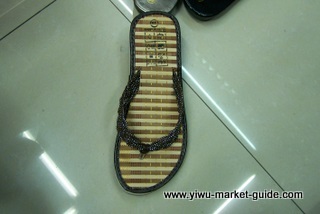 Yiwu market is good for price, so is the shoes market here. You will find most of the shoes here are from 1.00 USD to 5.00 USD. 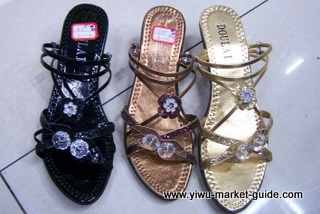 You can find some stylish rubber ladies’ sandals, with a flower/a butter fly/shining buttons and beads on the top, nice looking silver/golden color, only selling at 1.00 USD. Many shoes you find in your local shop shops can be bought at a 1/5 of its retail price here. You don’t need to worry too much about MOQ. They sound a bit “scary” sometimes, but in most cases, you can get what you want. You will hear lots of shops saying “1,000”, “1,200”, and “2,000”… for per design, but relax, because this is a market of about 2,600 wholesale shops, 20% of them are selling directly for their own factory. You can always find your products, either “in stock”, or “producing now” here and there. As a result, you will always get most of what you want in the end. However, you’d better keep each order from a shop above 500.00 USD, otherwise, there is a bigger possibility that they will find excuses not to deliver your orders in the end. This is a market of 2,600 shops. They can’t survive if they all have the same stuff inside their shop. They simply cannot compete in a “bloody red sea”. Sandals, slippers, rain boots, working shoes, safety shoes, leather, rubber, PU, cloth, ladies shoes, men shoes, kids shoes… are all being selling here, within half a floor of 12 streets. You can easily cover them all with 4-5 days. Then your shop will be a richest variety in your local market. You will have busy time. P.S. if your shop is also selling socks or belts, then it will be easier for you to bring in socks and belts from Yiwu. Socks are in the same building of shoes, on the first floor, while belts are on the fourth floor. 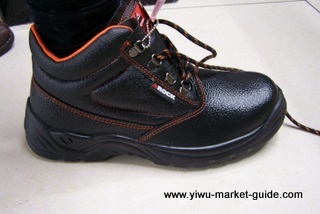 >> Return to buy from Yiwu from buy shoes from yiwu market.